For SAMPLE BOOKS, click here. Standard & Ground (or Wave? )-Breaking Medina, Pedro de. Arte del navigare. Venetia: Appresso Tomaso Baglioni, 1609. 4to (20.5 cm, 8"). A4 b4 2A8 B–Q8 R10; , [1 (blank)], 137, [1 (blank)] ff. ; illus.  Pedro de Medina’s (1493–1567) Arte de navegar (originally published in Spanish in 1545) was a ground-breaking work on compass navigation, and became a standard manual translated into many languages. Medina was famous as a mathematician and cosmographer, and the king of Spain placed him in charge of examining pilots and masters for the West Indies. This second Italian edition (the first was printed in 1554) was translated by Vincenzo Palentino; it has a title-page in red and black with a woodcut printer’s device, and woodcut initials, tables, and illustrations, many showing how to make celestial observations. Also included is a woodcut map showing Europe, the Atlantic, and the New World. For more MATHEMATICS, click here. OR for PRE-1820 AMERICANA, click here. Memorial biographies of the New England Historic Genealogical Society. Boston: Pub. by the Society, 1880. 8vo (24.5 cm, 9.6"). 533 pp.  First edition of the first volume in a series compiled and published by the oldest genealogical society in the United States. Among the biographies present are entries on Harrison Gray Otis, Albert Gallatin, William Ingalls, and Daniel Webster. If you don't mind those Chipped labels . . . QUITE Satisfactory! Metastasio, Pietro. Opere scelte di Pietro Metastasio. Drammi (vols. I, II, & 3); Azioni e feste teatrali; Opere sacre [,] poesie varie e traduzioni. Milan: Societa Tipografica de' Classici Italiani, 1820. 8vo. 5 vols. I: Frontis., LV, , 565,  pp. II: 642,  pp. III: 646,  pp. (lacking half-title). IV: 626,  pp. V: , 617, [11 (index)] pp.  Five-volume set of collected works by the celebrated 18th-century poet and librettist, with the first three volumes dedicated to his historical plays. New Mexico, Texas, & California Mexico. Laws, statutes, etc. 18 January 1845. Broadside. Begins: sabed: Que el Congreso general ha decretado y el Ejecutivo sancionado lo siguiente. En el estado actual de la República Mexicana, los Departamentos fronterizos ... Mexico: No publisher/printer, 1845. Small 8vo (21 cm; 8.25"). p.
 This law promulgated by Interim President Herrera clarifies and defines part 17 of article 134 of the Bases orgánicas (i.e., Santa Anna's constitution of 1843). It declares Chiapas, New Mexico, Texas, and Alta California to be border states: The question being settled was which states were to have their governors appointed by the central government, others being permitted to submit a list of five candidates. Signed in type by Gonzaga Cuevas. Of course, by 1845 Texas was nine years past its 2 March 1836 Declaration of Independence from Mexico and was on the verge of being admitted to U.S. statehood, although Mexico still failed to recognize the fact. But New Mexico and California were still one year from being wrenched away via the Mexican-American War (i.e., La intervención estadounidense en México, La Guerra de 1846). For general CATHOLICA, click here. 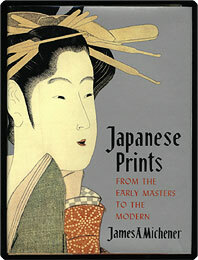 Michener on Japanese Woodblocks Michener, James A. Japanese prints from the early masters to the modern. Rutland, VT & Tokyo, Japan: Charles E. Tuttle Co., (copyright 1959). Folio (31.7 cm, 12.5"). 287,  pp. ; plts., 6 fold.  First edition of this “tour of three centuries of art,” conducted by famed novelist Michener. 257 illustrations decorate the substantial volume, including 55 in full color; many are full-page, others in-text or several to a page. Mifflin, Samuel. Document signed on parchment, in English. “Exemplification of a common recovery with double vouchers of the messuage & plantation in Blockley late the estate of Morton Garrett.” Philadelphia, 1776. Folio (51.5 cm, 20.5"). p.
For more of WOMEN's interest click here. Benthamite/Utilitarian/Imperialist History of India Mill, James. The history of British India ... in six volumes. London: Baldwin, Cradock, & Joy, 1826. 8vo (23.1 cm, 9.1"). 6 vols. I: iv, xxxv, , 450 pp. ; 1 map. II: iv, 463,  pp. ; 1 map. III: iv, 571,  pp. IV: iv, 508 pp. V: iv, 546 pp. VI: iv, , 631,  pp.  A best-seller at the time of its publication and still widely studied, this influential work provides a critical examination of the British presence in India, along with a general account of the country and her religions, government, law, arts, and economy. The author was a prominent Scottish Utilitarian economist, philosopher, and ally of Jeremy Bentham's; he freely acknowledged never having visited India himself. This is the third edition, following the first of 1817; the set is in the publisher's original bindings, and an uncut copy. Vol. I opens with an oversized, folding, hand-colored “Map of Hindoostan” done by Aaron Arrowsmith, while vol. II opens with an oversized, folding map of Persia, Afghanistan, etc. A Scarce Reading, Pa., Imprint Miller, Georg. Des Evan. Pred. G. Miller’s Kurze und deutliche Lehren zum wahren und thätigen Christenthum; aufgesetzt in der reinen Absicht zu Gottes Lob und zum Nutzen der Menschheit. [Reading, Pa.]: Gedruckt von John G. Jungman, 1814. 12mo (14.5 cm; 5.75"). 225,  pp.  Apparently the second of only two publications from Miller (1774–1816). This one deals with God's love and is one of the few German-American books in our experience with a list of subscribers (“Die Patronen der ersten Auflage,” p. 2). Provenance: “John Wintling, his book, 1815" on front pastedown. In the State Library of Pennsylvania and given to the Crozer Theological Library; later in the library of the Colgate Rochester Crozer Divinity School; deaccessioned. For SCOTLAND & SCOTS, click here! Or for a collection of COLLECTIONS, click here. Colonial Brazilian Medical Work Miranda, João Cardoso de. Relaçaõ cirurgica, e médica, na qual se trata, e declara especialmente hum novo methodo para curar a infecçaõ escorbutica, ou mal de Loanda, e todos os seus productos, fazendo para isso manifestos dous especificos, e muy particulares remedios. Lisboa: Na officina de Miguel Rodrigues, impressor, 1747. Folio (30 cm, 11.75"). ff., 235,  pp.  The true first edition: The copies with 1741 on the title-page were actually printed in 1752, as the dates of the licences clearly demonstrate. Also, those copies are, as expected with a second edition, in smaller format, i.e., quarto. Cardoso de Miranda was a “cirurgiam approvado, natural da Freguezia de S. Martinho de Cambres junto á cidade de Lamego, e de presente assistente nesta da Bahia de todos os Santos” as proclaimed on the title-page. He also practiced medicine in Minas Geraes, and owned a galleon engaged in commerce with Africa. His work covers the treatment of tropical diseases, fevers, gonorrhea, scurvy, etc. The text includes letters addressed to the author from various Brazilian physicians, along with a tribute in verse addressed to the book itself. Borba de Moraes writes of the Relaçaõ cirurgica: “a famous book of Brazilian medicine. The text is seldom studied because of the rarity of both editions.” Searches of NUC and WorldCat find only three U.S. libraries (RPJCB, DNLM, NNNAM) reporting ownership of the first edition. Binding: Modern calf excellently executed in the18th-century style, gilt extra spine with red leather gilt label; boards with modestly elegant gilt roll at perimeter of boards, plain endpapers. For PORTUGAL / PORTUGUESE, click here. For FINE, ATTRACTIVE, & INTERESTING BINDINGS, click here. For more INVENTIONS, click here.